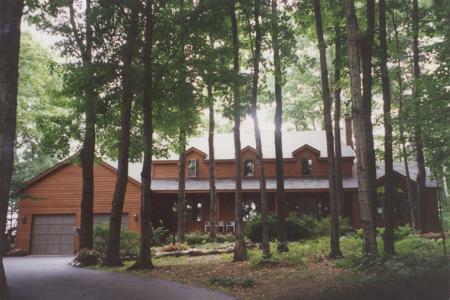 We are retiring from the bed and breakfast business after 28 years. Thank you to all who have stayed with us over the years. This charming country home on West Grand Traverse Bay, in Northern Michigan's beautiful Leelanau Peninsula, offers a secluded setting with a private sandy beach, beautiful woods, and cherry orchards. Conveniently located between Traverse City and Suttons Bay, you can enjoy all that Traverse City has to offer as well as explore beautiful Leelanau County - Land of Delight. Whether your desire is to tour wineries, tee off at one of the many area golf courses, visit local marinas and beaches, or shop one of the many quaint towns in the area, you will find it here. Fine dining and casual restaurants are minutes away. The Leelanau Sands Casino and Showroom and the Interlochen Center for the Arts offer entertainment year 'round. Other local attractions include the annual National Cherry Festival, the Dennos Museum, the Grand Traverse Mall, and numerous antique shops and art fairs. We have welcomed 341095 guests through our online doors.